Virat Kohli has been enjoying some good time around; both on and off the field. First, he led India to their maiden Test series triumph in Australia. Then, he played a part in India taking an unassailable 3-0 lead in the ongoing five-match ODI series against hosts New Zealand. Now that the job’s been done, Kohli is set to finally enjoy some downtime. At the start of the series, the Board of Control for Cricket in India (BCCI) announced Kohli had been rested for the fourth and the fifth ODIs as well as the subsequent Twenty20 series, keeping in the mind the heavy workload in recent times. 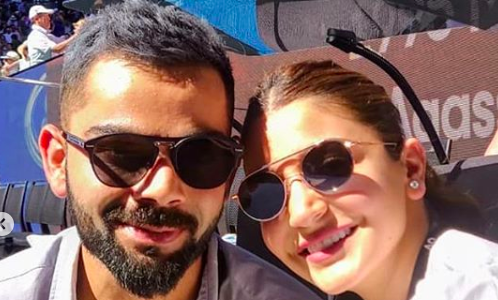 On Tuesday, Kohli took to his official Twitter handle to share a picture of himself jetting off with his wife, Bollywood actress Anushka Sharma. “Away we go #travelswithher,” the 30-year-old wrote the caption to his 28.1 million followers. Opening batsman Rohit Sharma will lead India in the rest of the matches. Kohli, meanwhile, is expected to be back at the helm for Australia’s tour of India. The series, comprising of two Twenty20s and five ODIs, will get under way on February 24 in what would be the last dress rehearsal for the 2019 World Cup in England and Wales.